Sturdy and quite attractive I was looking for a way to easily adapt my desk at work for standing in a way that I could switch back and forth easily if I felt like standing for part of the day and sitting for another. This piece works well so far. It’s sufficiently sturdy and quite attractive. Great for standing while working I like that this is portable if required and I can move it from home to work if needed. It was inexpensive enough to buy as my own personal property. 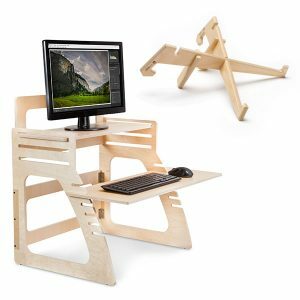 It’s great for standing while working and easy to switch between the sitting and standing. Rock-solid set up I didn’t need — or want — a replacement for my sit-down desk. This is a perfect solution as it holds a keyboard and mouse on the bottom shelf and the monitor shelf can be adjusted to sit perfectly at eye level. It takes about 10 seconds to switch back and forth from standing to sitting. Plus it’s a rock-solid set up with no shakes or vibrations when typing. Highly recommended. A relief to stand up Sitting disease is the new smoking I heard, so I wanted to move around more and working while standing helps me do that. This set up has worked really well and it really is a relief to stand up every now and then and get the blood flowing. I can’t recommend these enough. My back has never felt better! My back has never felt better! Sitting for long periods of time aggravates my lower back. The Well Desk allows me to keep working and be productive while on my feet. After using the Well Desk for just a couple of weeks, I felt much less lower back pain. It is a great product for people who can’t sit at a desk all day. Looks pretty stylish I bought this product about 2 weeks ago and had it delivered to my office. I assembled it in no time and it now sits on top of my desk where I work from it at least 30% of the day. No problem with assembly and it looks pretty stylish! For the price, this has worked well. A perfect option to convert normal desks into standing desks without spending a fortune I ordered 12 of these for my office staff to use. We have been extremely happy for 3 main reasons: 1. They are fully adjustable so they work for people of any height. 2. They are lightweight but sturdy so they can be used on top of an existing desk without any damage and are completely non-slip. 3. It literally takes about 2 minutes to assemble the desk. These have been a perfect option to convert normal desks into standing desks without spending a fortune. Increases my productivity level Standing desks are expensive. I bought this as a trial based on the suggestion of a friend. Standing up has helped my back pain and increases my productivity level a bit. Now when I take a break, I can sit and actually feel like I am getting a break. It is a good desk especially if you are not sure about committing to the expense of an electric standing desk. Already made a huge difference in my productivity and mood It’s been a week with the desk so far and it’s already made a huge difference in my productivity and mood. I would recommend it to anyone who is considering a shift away from the desk chair and wants to try standing up. Feels wonderful to get the blood circulating in the legs and buttocks after sitting for so long! Worked out perfectly I was looking for some kind of desk that would allow me to work on my office computer while on my feet and without having to spend a fortune to do so. I did not like the way my legs (pins and needles) and back (aching) were feeling from sitting all day. I’ve had the desk for about 2 months and it has worked out perfectly. A terrific stand up desk for my needs This is a terrific stand up desk for my needs, large enough to fit what I want, just the right height for me (I’m about 5′ 9″). Quality is good. 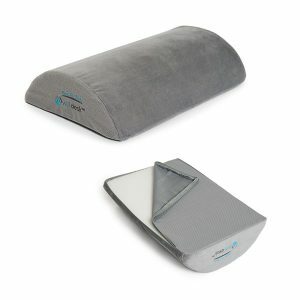 I highly recommend this desk converter I purchased four of these for my team members and we love them. They are easy to assemble, sturdy to work with, and have nice clean lines. It is very easy to move between standing and sitting because all you have to do is stand up! I highly recommend this desk converter because it’s a good system to use to easily switch from a sitting desk to a standing one. Small investment for a lot of benefit! The desk is perfect! The size is just right without encroaching on too much desk space and it was so easy to put together too. Very stable and ‘clean’ looking on my current desk at work. It’s amazing how much better I feel at the end of the day and my shoulders and back don’t hurt (my feet are still getting used to standing though even with anti-fatigue mat). Small investment for a lot of benefit! Sitting is toxic to the body! Helped my back pain This desk really helped with my lower back pain from sitting for long periods at work. I highly recommend this desk. Great product, great price and a great innovation. Love this desk! My back is feeling so much better now that I’m standing most of the day. It’s also really easy to swap out from when I want to sit down. Great product, great price and a great innovation. Thanks guys. Exactly what I was looking for This is exactly what I was looking for! It saves me the expense of buying a new desk and it solves my back problem from having to sit all of the time. It is relatively light weight and is easy to lift onto my existing table. There is ample space for my laptop and mouse with space to spare. If you are considering a stand up desk, try this out first! Great solution to my cubicle sitting disease The desk is easy to use and a great solution to my cubicle sitting disease. I stood up for a few hours the first day and felt the difference that night. My manager saw me standing up and she liked it so much she bought one too and no complaints about rules and regulations! I just feel healthier I have been working from home and am hunched in front of my computer for far more hours than is healthy. My back was becoming increasingly sore and my shoulders aching. After purchasing the desk and standing at regular intervals I just feel healthier. I love my Well Desk and have been telling my friends about it. Something so simple has improved my day to day working life This product is amazing! I can’t believe something so simple has improved my day to day working life! I would suggest this product to anyone who needs to mix up the sit-stand situation at their work place. I am happy I found this and would recommend to others. All my colleagues want these now! Look no further I had been researching the benefits of a standing desk and decided to try this one as a trial run before investing in a full blown electric desk. However I don’t think I will be needing to look further. This is plenty sturdy enough for my large monitor and keyboard and there is an opening below that adds to the overall space. I feel more awake and less fatigued, fewer head-aches and overall in a better more energized mood. As for the height, I am 5’7″ and it works fine for me. I can’t see being without one now I really like this desk for a number of reasons: 1) it works beautifully for the purpose advertised – allows you to convert a regular desk into a standup desk. 2) The desk is very sturdy on its legs – no wobbling. 3) The overall usability is great because the shelves make it perfectly height adjustable. I love this addition to my office and it is getting constant use. I can’t see being without one now. My back issues related to work are gone I work at home and sit 10 hours each day at a desk staring at a computer. I have chronic back issue due to this arrangement. Since purchasing this item, my workday primarily consists of standing as opposed to sitting. My back issues related to work are gone. The quality of life improvements associated with the improvements to my back cannot be understated. I may buy a 2nd one for home! This desk is perfect. It looks great, perfect height adjustments. This was very easy to setup at the office and has a lot of space for monitor, keyboard and mouse. I may buy a 2nd one for home!